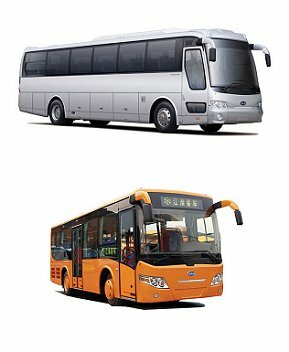 JAC Coaches - ANHUI JAC COACHES CO., LTD, is one of the key enterprises of JAC Group, China, with history of producing buses of over 50 years, and it has two production bases in Hefei Headquarter and Yang Zhou Branch. JAC Coaches Company has coverage of 410,000 square meters, annual production capacity of 12,000 buses. JAC Coaches Company is mainly engaged in producing, developing and selling buses. Based on 50 years coach production techniques, JAC COACHES attracts and assimilates advanced foreign techniques, and relied on advantageous resources of JAC Chassis, it keeps on expanding and innovating to gain self-developed. As the provincial Hi-Tech enterprise, JAC Coaches Company passed the ISO9001 quality system certification in Sept. 2001. In 2003, all of our products have passed the 3C(China Compulsory Certification). In Sept. 2005, JAC Coaches passed the ISO/TS 16949 quality system certification, In sept. 2008, our company successfully passed GJB9001a-2001 National Military Standard system, which made the big step to higher level of modern&scientific administration. Our product is well accepted not only in the field of tourism, passenger transportation, but also in inner city transportation and special-type market. What's more, our products have been exported to oversea countries, more than 30 countries and districts. As the oversea market pattern is changing, JAC group's international strategy will be a model for the mission "JAC automobile, around the world". Based on the vision of the JAC Automotive Group—“Make better product, create more beautiful society”, JAC Coaches Company devotes itself to the advancement of national automobile industry with receiving the theory of “Integrated consideration, Learning by team” and insisting on technology & system innovation. JAC Coaches Company try best to establish an international brand and make the' dream of manufacturing the international bus come true!